Skip the store and head straight to work for farm-to-table greens. Here’s the thing about the grocery aisle: Most of the ‘fresh’ produce has been trucked from nobody-knows-where, preserved since nobody-knows-when, and tastes…fine, at best. In spite of this, you still buy it, pack it up, and bring it to work with you the next day for an equally fine meal. Or, maybe you’re not a pack-a-lunch kind of person, and you head to the office cafe and try to get excited about iceberg lettuce. Back at your desk, you munch away, and slowly your ‘meh’ meal fades into the background of the workday. We think you can do better, so we created Grown by Freight Farms, an on-site farming service. Freight Farms will install a container farm for your office, operate it top to bottom, and bring you all the food. It doesn’t get any fresher than that, and you can use the greens in the office cafeteria, or for an on-site CSA program! Fresh | Our greens are harvested the same day as delivery so that you get the freshest greens around. Because of that, these plants have less nutrient deterioration than their grocery-store cousins. Clean | All the greens come from non-GMO seeds and never use herbicides, pesticides, or any other additives. There’s also less risk of exposure to food-borne illnesses (none of that deadly E.coli lettuce). Nutritious | Leafy greens are low-cal, high-fiber, and chock-full of valuable vitamins and minerals. Some of our customers have even integrated Grown into their health insurance incentive programs! Here are 5 ways Grown by Freight Farms will redefine your relationship with your greens. (1) An enviable new office perk. In 2018, the Freight Farms team won Bostinno’s Coolest Office Perks Award because we have fresh veggies in the kitchen and a futuristic farm in the parking lot! Grown by Freight Farms lets you replicate the same perk at your office to create a corporate culture that makes your friends envious that all they get are Doritos and overhead fluorescent lighting. (2) A sustainability initiative everyone can join. Local food eliminates the need for long-distance transport and reduces the environmental impact of your shopping cart. Our greens are hyper-local: we count the distance from farm to plate counted in meters, not miles, to help achieve sustainability at the office without expensive construction or additional personnel. (3) A sure way to get out of your lunchtime rut. Our farm can grow OVER 200 VARIETIES. Yeah, you read that right. With Grown, you can experience distinct tastes that you would never find at the store. Sorrel has an intense lemony flavor; Rex Butterhead lettuce is fresh and crisp as heck; and Wasabi Arugula will actually make your eyes water. No more yawn-worthy salads for you! (4) Farm-to-fork without a trip to the farmers market. Grown brings you produce that is fresher and more flavorful, thanks to a significantly shorter travel time from farm to desk. We’re delivering greens harvested just hours ago by literally walking them across the parking lot. (5) Perfect for anyone who forgets what’s in their fridge. Our greens last SO LONG: lettuces and leafy greens will last 2-3 weeks, while herbs can last up to a month*! They last this long because they’re not spending their best days on the back of some truck. Plus, all the lettuces are delivered with their root balls still attached, which keeps the plant alive even after harvest. *This is based on produce that was kept in airtight plastic packaging for the entire time. 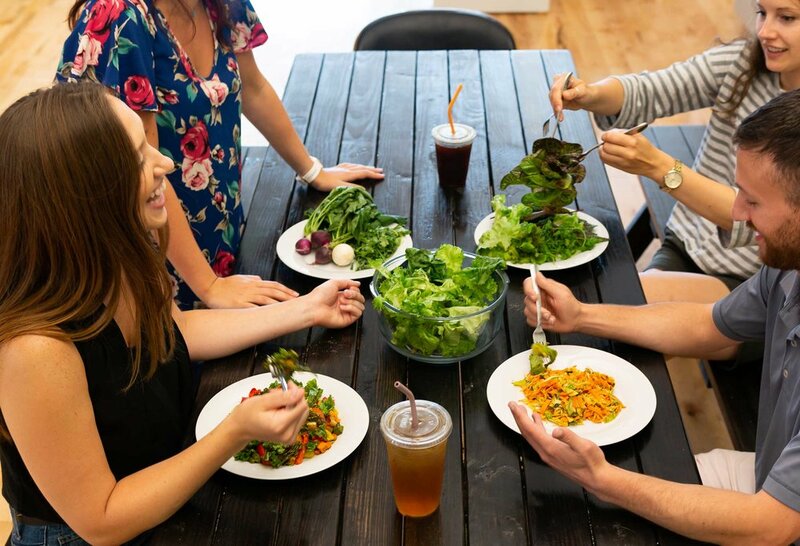 The nicest thing about Grown by Freight Farms is that we make it incredibly easy for you to enjoy all these benefits at your office. We do all the difficult thinking and planning, all that you need to do is enjoy! Everything’s a subscription now, even farming! Just how bad for you are these food related chemicals?